When in the course of human events it becomes necessary for one people to dissolve the literary rifts that have separated them from another, and to reverse the unbalanced powers of opportunity, the separate and unequal station to which the laws of publishing have forced them, a decent respect to the opinions of their readership requires that they should declare the reasons for their subversive tactics. We hold these truths to be self-evident: that all writers are NOT treated equal; that some are undeservedly endowed by their university or publishing house with a certain level of haughty privilege; and that in the literary world we are entitled to a Byline, Publication and pursuit of an Audience. Therefore, we, under the guise of the Guerilla Poetics Project (GPP), are determined to construct doors in the house of publishing where none currently exist, at least for the vast majority of the poets outside of academia. We endeavor to return poetry to whom it was originally intended: the reader. 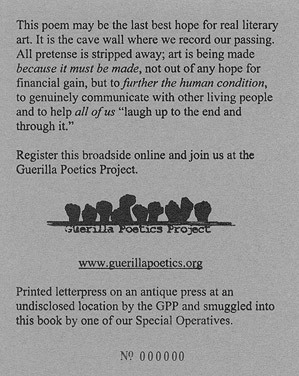 And we feel there is no better way to accomplish this goal than to use the existing hierarchy and structure of the publishing world to our advantage: by subversively hiding high-quality broadsides of high-quality poems inside books in bookstores and libraries to be found by unsuspecting readers. We, the Core Group of the GPP, are a loose knit association of ten writers and publishers who have been working in the small press for a collectively large number of years. The small press is a publishing arena filled with magazines, journals, online publications, 'zines, fold and staple chapbooks, poetry, short stories and art all made by so-called "regular folks;" from teachers to cooks, from secretaries to strippers, from cabbies to card players. This small press is in direct opposition to the mentality of our current cultural climate, both in the mainstream world of slick televised "reality" and pop music made by machines with pre-disintegrated components, easily sold and easily reproduced ad nauseam, to the large press of university magazines staffed by editors publishing grant recipients, workshop geniuses and other university magazine editor's obscure verse designed to puzzle and stymie the very people poetry is supposed to affect most. We here at the GPP believe that poetry is about the human condition. We believe poetry is a hoarse cry "against the dying of the light." We believe that art in its finest expression is the pure distillation of what it means to be human and alive, suffering and dancing up to the edge of the grave. And finally, we believe poetry is about communication: the writer to reader sure, but more importantly, the human to another mortal human. We are putting the world on notice: we are here; we are writing; and we want your attention. If you're not willing to give us your attention, then we will take it from you. We will be heard. Are you listening?